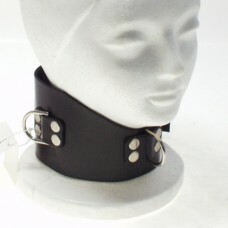 Heavy latigo leather collar from Northbound Leather. It's about 3" wide and approximately 19" long. Very strict. 3 large d-rings and a buckling closure. Locking slave collar from Northbound Leather. It's about 2" wide at the thinnest and 3.25" at the wi..
Leather posture collar w ring. Buckle closure, small. Approximately 14-15 inches long, 3-1/2 inches ..